A Philadelphia Guy's Blog: Vacation! So, two weeks ago we went on vacation, up to Ricketts Glen State Park (PA). Let me tell you, it was absolutely amazing up there. We left on Sunday, so as a bonus all of the traffic was heading home, as we headed up into the mountains. It only took us about two and a half hours to get there and while they are relatively low mountains (hey, we don't have the Rockies in Pennsylvania), there was about a 10-15 degree temperature difference. Well, guess who doesn't remember to bring pants? Yeah. Shorts, I have. Pants? Hey, its summer, who needs pants, right? By Wednesday, I drove 40 miles to around Bloomsburg to buy a pair of sweats. Mosquitos and 50 degree temps will do that to you. The main attraction of Ricketts Glen is the Waterfall Trail, about 4 miles of almost-climbing into and out of a gorge, with 22 waterfalls along the way. It was absolutely gorgeous, and just the exercise I needed. 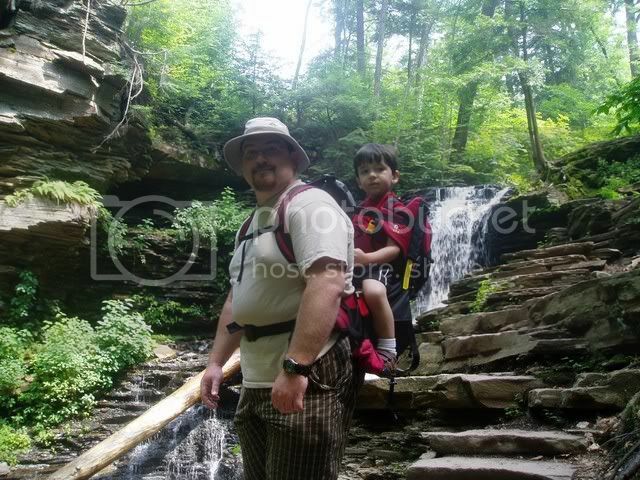 I also had the smaller rugrat on my back the whole time, so I did the trail with 50 lbs. on my back. Suzanne gets an honorable mention for also attaching full water bottles to the pack, adding a few more on. Hell, just put a saddle on my back and give me a feedbag why don't ya? I thought we were going to run out of stuff to do, but WOW - No way. 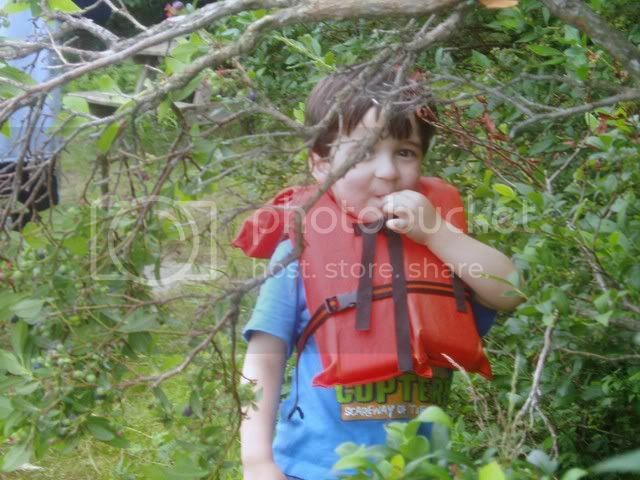 We hiked, went boating on the lake, picked blueber ries (this place had wild blueberry bushes EVERYWHERE)... Didn't need anything else. We all had a blast. Speaking of the blueberries, I figure we each ate about two pints of blueberries ourselves while there, then brought home a pint or two as well. Having picked them, I'm glad there are others that have to do so commerically. It reminds me of eating steamed crabs, or unpeeled shrimp - Lots of work for a little reward. While it was chilly at night, we couldn't have asked for better weather. It didn't rain until the morning we left. Couldn't ask for more. Oh, and before anyone thinks I'm a camera hog -- Unfortunately, we didn't have electric at the campground like we were told we would, so the battery died a couple days in. Sue was taking pictures while I carried Steven, so... Yeah, she got out of the photos. Not my fault.